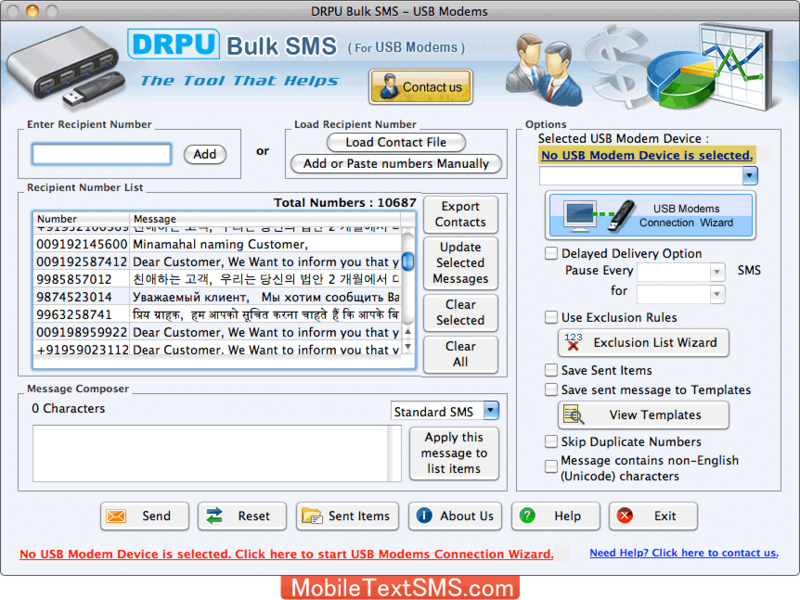 Bulk SMS messaging software send mass text messages from Mac machine to numbers of mobile phones using USB modems. Text SMS gateway program can send text messages in the form of greetings, news alerts, invitations, share market updates, business campaigns and other personalized SMS over worldwide without requiring any internet facility. No need to type same text message again and again, just install bulk text SMS software on your MAC machine and sends group text messages directly over global mobile network. Send bulk text messages instantly: Software sends group text messages across the world from your apple Mac OS X installed machine to cell phone using USB modem. Supports all Unicode languages: Mac text message program can broadcast thousand of SMS over national or internal mobile network in any text format. Prevents number redundancy: SMS gateway application provides facility to skip duplicate contact number entries while sending bulk sms. Saves sent text message details: Text messaging tool for MAC OS X provides option to save sent messages details to templates which can be viewed later whenever requires. Broadcast notifications and standard messages: Bulk SMS software can forward notifications and standard messages to your friends, relatives, business partners and family members at any time around the world.